Illustration of TET-based device for use in point of care testing. Roy Cohen has led his team in the laboratory of Dr. Alex Travis at the Baker Institute for Animal Health at Cornell’s College of Veterinary Medicine in the development of a platform technology using tethered enzyme-based biosensors with wide-ranging applications. 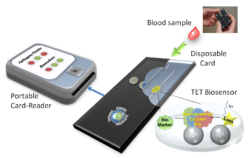 Tethered Enzyme Technology™ (TET™) addresses a growing need for rapid, low-cost, and flexible point-of-care diagnosis of a variety of conditions by means of biomarker detection. TET harnesses the catalytic efficiency of enzymes to provide an easy-to-use, single device, point-of-care system for analyzing multiple biomarker classes, including proteins, nucleic acids, ions, metabolites, and toxins. “We have designed TET assays that are in various stages of development for detection of over 30 different biomarkers (and counting) that are clinically relevant to brain injuries, several types of cancers, liver disease, cardiac pathologies, and infectious disease,” said Cohen. This technology has been supported by two rounds of Cornell Technology Acceleration and Maturation (CTAM) funding. The first round allowed the group to purchase an automated multi-well plate dispenser, enabling them to produce 96-well and 384-well plates as TET biosensor arrays, in a “high-throughput,” quality-controlled manner to enable clinical collaborations with area hospitals. These collaborations have already resulted in a peer-reviewed publication showing that TET-based assays provide important and clinically meaningful advantages over commonly used systems, including antibody-based ELISAs. CTAM funding was implemented to enable further development of Cornell technologies that might be considered “too early” for a commercialization partnership. CTAM’s objective is to address the “invest-ability” gaps and “license-ability” that deter signification investment, strategic partnership, or acquisition. For each CTAM project, the fund provides up to a $50,000 investment that can be used for activities such as prototype development, strengthening patent applications, beta-testing, data analysis, market research, and business plan refinement. The group’s second and current round of CTAM funding has allowed them to generate sufficient data using TET to enable the filing of a new provisional patent application for the point-of-care detection of nucleic acids, including micro RNAs. “Detection of nucleic acid biomarkers, such as micro RNAs is a remarkable opportunity to exponentially expand the potential clinical applications for TET in both human and veterinary medicine,” said Cohen. Cohen and his group in concert with the Center for Technology Licensing are working to advance the TET technology by identifying industry partners and investors to support the clinical development of TET as a point-of-care diagnostic platform.